Our customers specify what they want done and how the cleaned items should be finished and packaged. We specialise in caring for smaller orders and process in small batches. Our activity is measured by the number of orders processed, not tonnes processed. We have very few restrictions on the types of washable items that we will process. Our customers are free to determine exactly what types of items suit their needs (colours, patterns, quality, shapes, sizes, etc.) and we process it for them. We frequently process 'one-offs'. Our systems are designed to track individual customers' items to ensure that their specific care requirements and deadlines are met. Because we use proper industrial laundry equipment we can wash and finish at higher temperatures and give more effective cleaning, disinfection, and finishing. 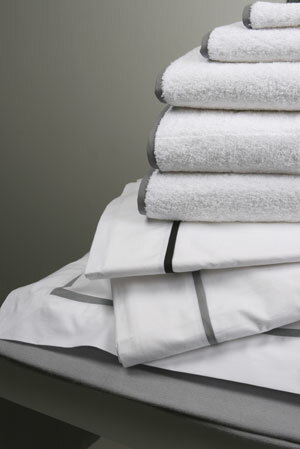 While we specialise in handling customers’ own items, we do have a number of clients who rent linen from Page Boy. This is still handled through our batch methodology so rental items are kept exclusive to that customer. © Copyright 2010, Page Boy Laundry. All rights reserved.